The regulation by light of the composition of the photosynthetic apparatus was investigated in Arabidopsis thaliana (L.) Heynh. cv. Landsberg erecta. When grown in high- and low-irradiance white light, wild-type plants and photomorphogenic mutants showed large differences in their maximum photosynthetic rate and chlorophyll a/b ratios; such changes were abolished by growth in red light. Photosystem I (PSI) and PSII levels were measured in wild-type plants grown under a range of light environments; the results indicate that regulation of photosystem stoichiometry involves the specific detection of blue light. Supplementing red growth lights with low levels of blue light led to large increases in PSII content, while further increases in blue irradiance had the opposite effect; this latter response was abolished by the hy4 mutation, which affects certain events controlled by a blue-light receptor. 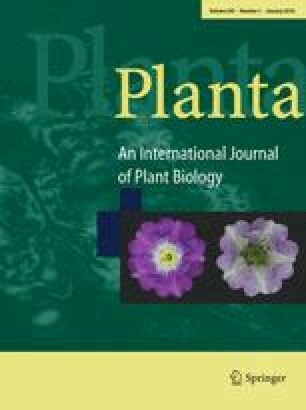 Mutants defective in the phytochrome photoreceptors retained regulation of photosystem stoichiometry. We discuss the results in terms of two separate responses controlled by blue-light receptors: a blue-high-fluence response which controls photosystem stoichiometry; and a blue-low-fluence response necessary for activation of such control. Variation in the irradiance of the red growth light revealed that the blue-high-fluence response is attenuated by red light; this may be evidence that photosystem stoichiometry is controlled not only by photoreceptors, but also by photosynthetic metabolism. This work was supported by Natural Environment Research Council Grant No. GR3/7571A. We would like to thank H. Smith (Botany Department, University of Leicester) and E. Murchie (INRA, Versailles) for helpful discussions.